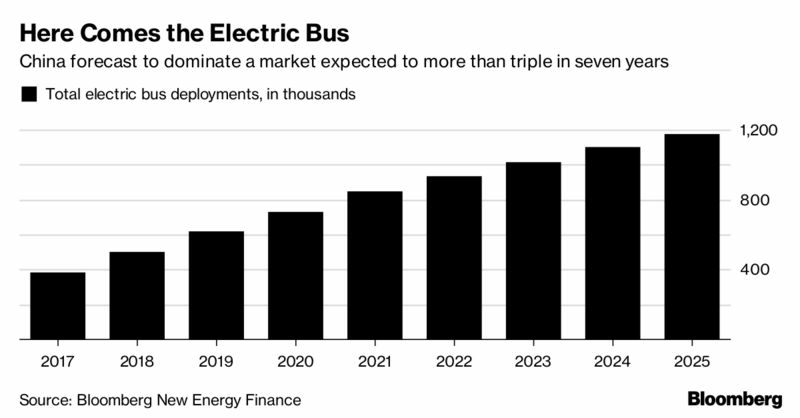 BLOOMBERG — The total number of electric buses in service is forecast to more than triple, from 386,000 last year to about 1.2 million in 2025, equal to about 47 percent of the worldwide city bus fleet, according to a report from Bloomberg New Energy Finance. ​“China will lead this market, due to strong domestic support and aggressive city-level targets,” wrote Aleksandra O’Donovan, an analyst for BNEF and author of the study. By 2025, the report said, the country will account for 99 percent of the world’s battery-powered buses. ​Public buses are a key part of the urban transit infrastructure, and the fact that they serve routine, fixed routes makes them ideal for electrification. Cities across the globe increasingly see electric buses as a way to reduce local air pollution, and such municipalities as Paris and Amsterdam have set goals to switch to zero-emission buses in the coming years. Earlier this week, mayors of some of California’s largest cities, including Los Angeles and San Jose, urged the state’s environmental regulator to introduce incentives and requirements to spur a shift toward electric buses from ones that use diesel or natural gas. China has set the most aggressive clean-energy bus-deployment targets. Warren Buffett-backed BYD Co., China’s largest seller of electric vehicles, is well-positioned to take advantage of this government push. Last year in China, BYD sold 100,183 new-energy vehicles—a category that includes full electric and hybrids), and the company’s buses now operate in 200 cities around the globe.